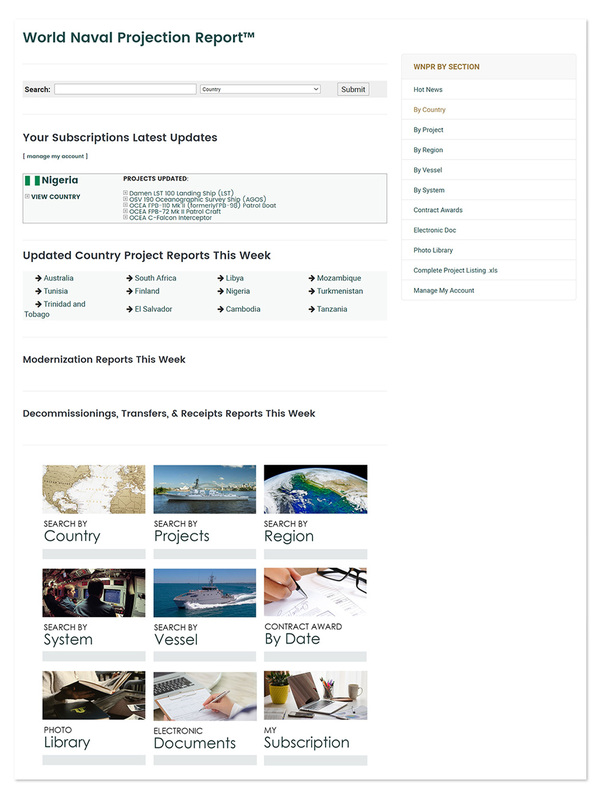 Our flagship product is the Worldwide Naval Projections Report (WNPR) database. WNPR reports on the 151 ocean based countries and specifically those that have the resources to buy, build, modernize and maintain a navy for coast guard type force. Each country in WNPR has a country briefing, corresponding new construction projects and modernization reporting to give strategy and business development professionals the essential information needed to identify key near term opportunities and future sales prospects. With a WNPR subscription service, customers receive monthly AMI HOT NEWS naval market forecast and modernization and ship transfer newsletters to stay abreast of breaking developments in the international naval market. Geographic information, territorial claims, languages, population, etc. Political structure and type of government. Economic overview, key indicators, trends and forecast. Defense and naval budget overview, trends, forecast and funding sources. Supplier trends and procurement processes. Navy organization, mission, order of battle. Projects Reports provide specific information on naval and coast guard new construction plans and activities by ship class and type. Hull, mechanical and electrical systems. Communications systems and data links. Integrated platform management, bridge control and internal communications systems. Modernization Reports are organized by country and describe over 500 current and future naval modernization and refit projects by ship class and individual unit. Ongoing force structure updates by country for naval and coast guard forces highlighting vessel decommissionings as well as transfers and receipts in the international naval market. Hot News newsletters are disseminated monthly to keep our clients abreast of breaking developments in the international naval marketplace and update WNPR country reports. The Naval Market Forecast and Modernization & Ship Transfer newsletters are delivered to your desktop via email or downloaded from archives. Contact one of our AMI team members for more information. AMI has been assisting naval industry and governments in their international projects since 1984. © 2018 AMI International, All Rights Reserved.